To train up young athletes to be confident, respectful, disciplined and skilled through the sport of baton twirling. Sophia Dinubilo, performs at the 2017 Twirl In The Woods contest held in The Woodlands, Texas. Follow Mickeys Majorettes on Twitter! Mickey’s Majorettes was established in 1992 by Patti Mickey. In the beginning, Mickey's Majorettes was small group of young girls who were interested in learning about baton twirling. They performed at recitals and marched in several local parades. Over the years, many young women have had the privilege of representing Mickey's Majorettes. Mrs. Mickey recognizes the benefits and is dedicated to individual instruction. 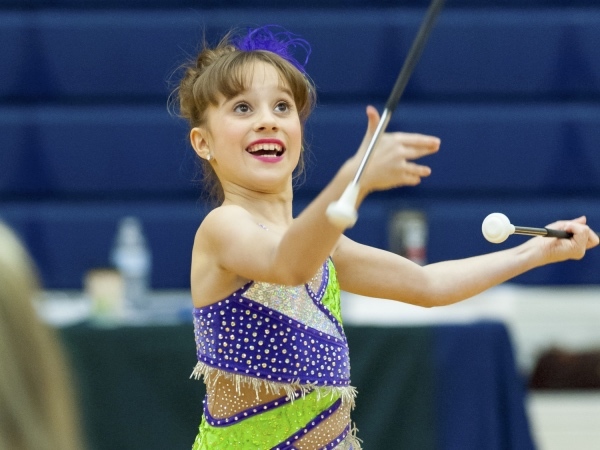 Not only does this allow each of her students to progress at her own pace, but she specially tailors each routine to highlight the strengths of every individual twirler. Most of Mrs. Mickey's former and current students have competed at the highest level in State, Regional and National competitions. Many Mickey’s Majorettes alumni have become outstanding in their fields and have been a credit to the sport of baton twirling and Mickey’s Majorettes. Above are the 2003 Feature Twirlers from The Woodlands High School. They are (left to right), Kelsi Beck, Kristine Allcott and Kayli Mickey.